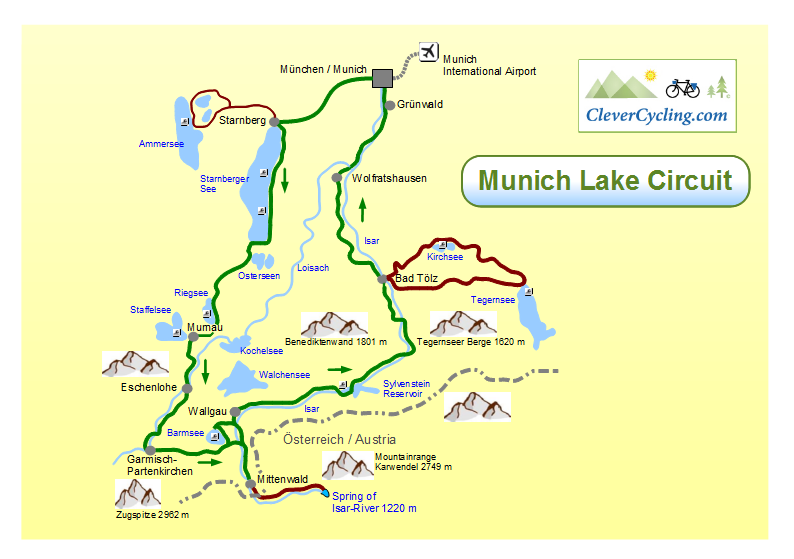 You will ride from the Bavarian Capital to the highest mountains in Germany. 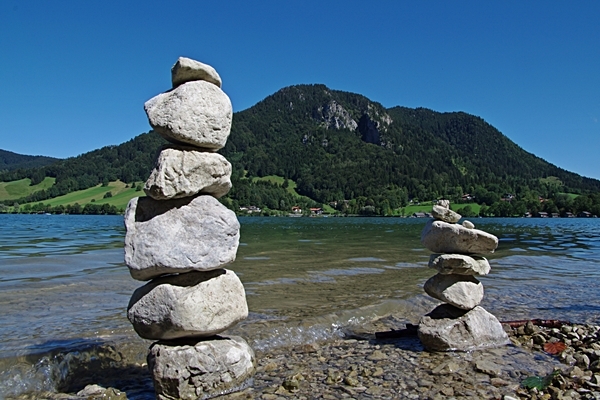 In between lie the Alpine Foothills with flourishing valleys, picturesque villages and of course the beautiful lakes. 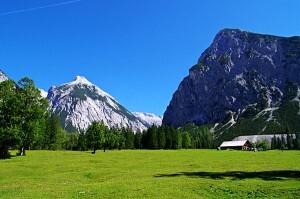 Some area will remind you at the "Heidi-movie". The villages along the cycle path offer Bavarian traditions, modern leisure facilities and peaceful quiet places for relaxation. A highlight of the trip is the journey to the spring of the Isar-River in the Alpine-Natural-Park Karwendelgebirge. 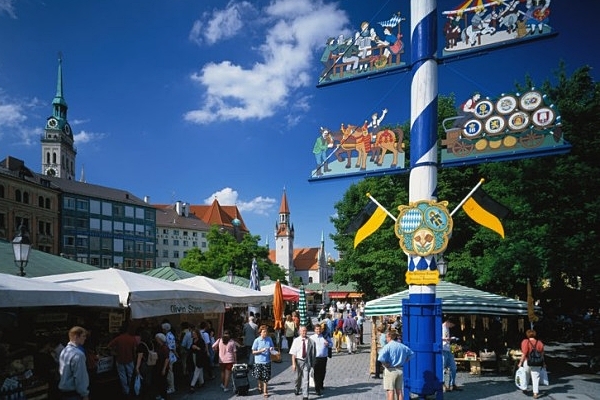 Bavaria's capital city offers countless attractions. You will receive a brochure from us with tips for your stay in Munich. Guided city tour* in the evening. Beginning at 20.30 clock / 8:30 pm. Duration approx. 2 hours. Quiet paths lead out of the city. Your destination is a small town on the north shore of the lake. From here, you can still make a round trip to three other lakes. On the horizon you may already have a good view of the Alps. Your path leads along the lake Starmberger See. Many stately villas and small castles line the route. Also the deathplace of King Ludwig II (the Fairy tale King of Bavaria) is near this route. 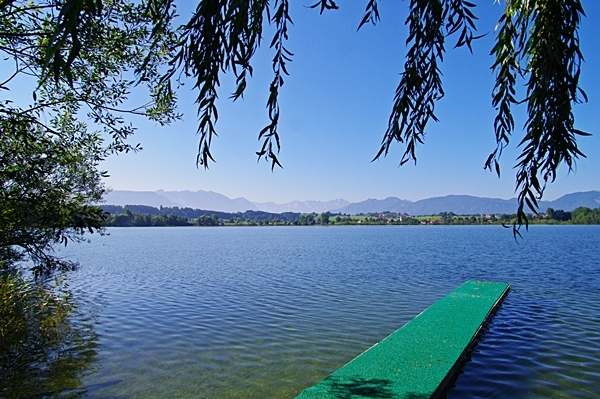 During sunny weather you can swim in the lake. The water is clear and has even drinking water quality! 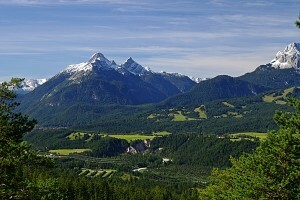 Your destination is the region around the small town of Murnau. The small town is located at the "foot" of the Alps, between two lakes. 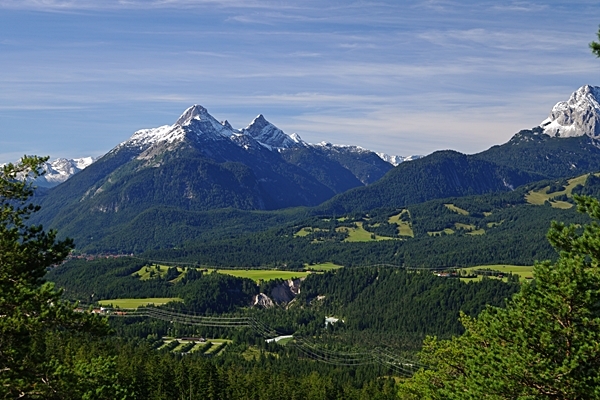 Past the Murnau Moor (Central Europe's largest mooorland area) you reach the highest mountains in Germany. A wonderful path leads you to Garmisch-Partenkirchen. Left and right of the path you will discover a rich flora in a wide river valley. 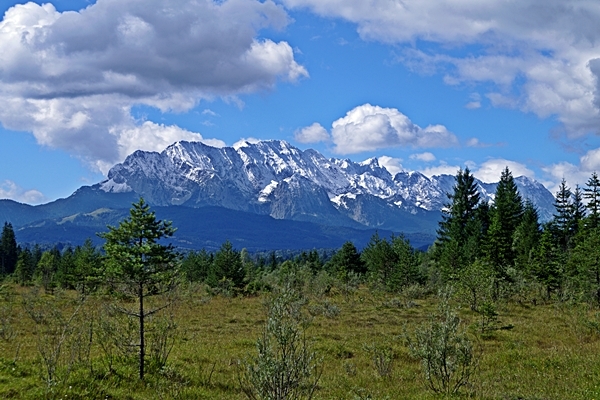 The view of the Zugspitze mountain range (2962 m 9718 ft.) is breathtaking. The difference in elevation from the valley to the summit is 2,200 meters / 7200 feet! Your path leads to the Olympic ski stadium and up into the mountain village of Mittenwald, based of a mighty mountain range. Mittenwald is the most famous "violins-construction-village" in Germany! The historic center has numerous painted hous-facades (Lüftlmalerei), an expression of Bavarian humor. Here you can find many original photo motives. 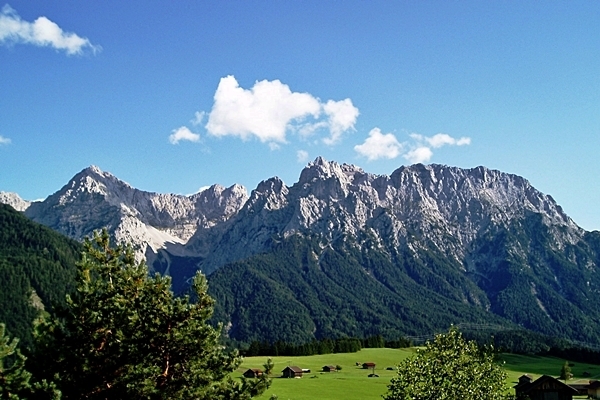 In the afternoon between 15.00 and 17.00 clock / 3:00 and 5:00 pm: Visit the spectacular Leutasch-George near Mittenwald. The scenic highlight of the journey awaits you. Wonderful quiet roads lead you into a stunning world of high mountains in Austria. You always follow the Isar river. This river is getting narrower and narrower until you arrive at its sources. 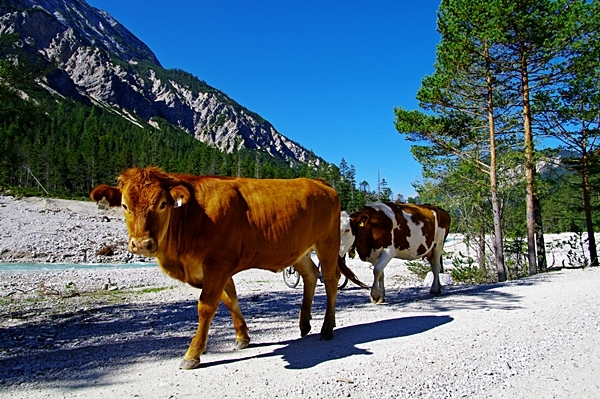 At the end of the valley you visit an old Alpine pasture, 1220 meter (4002 ft) above the sea level. At least you will believe to be in a “Heidi-movie”. Your return trip is on an equal route. Afternoon at 16.00 clock/ 4:00 pm: Cable car ride up in the Karwendel mountainrange 2.200 meter / 7220 ft. The Isar bike path runs through a beautiful alpine valley. You will pass the fjord-like reservoirlake Sylvenstein the Isarwinkel region. 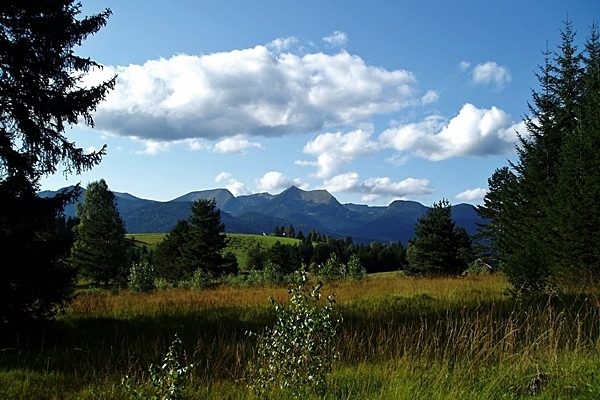 Shortly before your destination Bad Tölz you ride through a wide nature reserve area. By the way, this small town is a very popular moor and salt water spa. 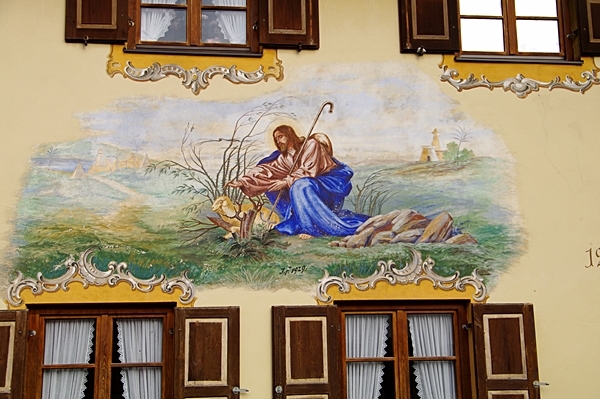 Also in this historic old town (pedestrian zone) you find sumptuous buildings with “Bavarian-facadeas paintings”. Numerous well-known artists and writers have visited this area. Cycling or relaxing? Just as you like! 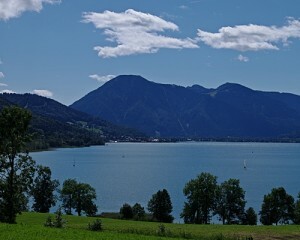 The circuit to the lakes Tegernsee and Kirchsee will be another perfect cycling-day. The gorgeous panorama-view from the shore of the lake Tegernsee ( one of the most famous lakes in Germany) is like taken from a picture book. Also a nice beach is ideal for swimming. Here you can admire splendid beach beauties. 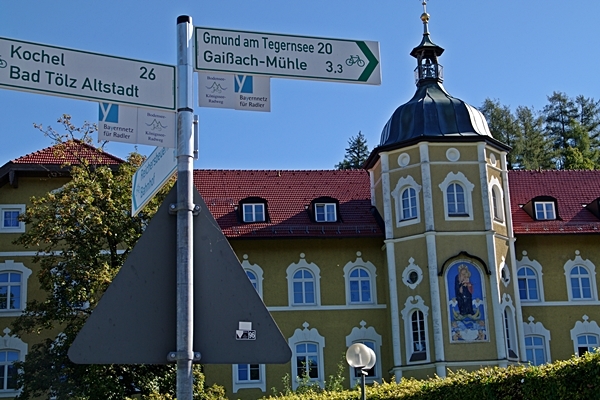 The second part of the route offers a beer garden in a monastery for the perfect break. In the background the lake and the Alps in the foreground – just beautiful. Or you prefer relaxing. The 34°C (93°F) warm thermal water of the famous spa “Alpamare” is perfect for tired muscles of sportmsman or -women! The "Isar-bike" trail will accompany you today. The green river with its white pebble banks and the view over the Alps will make your heart rejoice. The landscape will become more and more charming today: Gentle hills, a wide nature-reserve-area and some typical Bavarian beer-gardens. A view from the tower of a 600 year old castle above the Isar-Valley is a nice addition of your travel. The final in Munich is a pleasure trip on wide bike paths in the city-center. Our service for you: We are happy to book additional nights for you that you can explore Munich's beautiful City-Center and surrounding. Please note: This offer is not valid during the Oktoberfest. At that time, the prices are significantly higher. We'll make you a separate offer. optional personal support from the airport to the city center/hotel and back.